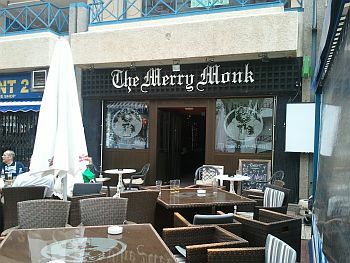 The Merry Monk, in the Apolo Center, Los Cristianos, is a long established bar providing quality live entertainment seven nights a week. It is a family-run bar, the family in question hailing from Wetherby, North Yorkshire. With decor like a typical Olde English pub, you'll find attentive bar staff, a great atmosphere and quality cabaret entertainment every night of the week. The "happy hour" concept reaches a new dimension here, lasting, each day, an impressive seven hours, from 12 noon until 7pm. Obviously, in the evening, when the entertainment is on, drinks return to normal prices. The artists generally start at around 10pm and go through till midnight (when, by law, all live music has to finish). A novel feature of this bar is their choice of cocktails. They don't just cater for adults, with the usual offerings, prepared by Peter, known affectionately as "Pedro". There is also an extensive range of "kids' cocktails" and the younger members of the clientele are also catered for by the presence of a pool table - always popular. Having been in this bar on more than one occasion, I can readily recommend it.